With an ever-growing number of galleries scattered around New York, it's easy to feel overwhelmed. Where to begin? Here at A.i.A., we are always on the hunt for clever, memorable shows that stand out in a crowded field. Below are eight fall shows our team of editors can't stop talking about. This week we check out meticulously sewn and constructed sculptures by Do Ho Suh at Lehmann Maupin, a new series of Alex Katz's trademark portraits at Gavin Brown, and Paul Henry Ramirez's eye-searing, abstract paintings at Galerie Richard. Pieter Hugo at Yossi Milo, through Oct. 29?For his latest series, South African photographer Pieter Hugo traveled to Agbogbloshie, a techno-waste site outside of Accra, Ghana, to document the people, mostly young men, who scavenge for bits of resalable metals. The ruined landscape, dotted with plumes of smoke, coils of burning wires and face-down monitors, looks truly post-apocalyptic. Do Ho Suh at Lehmann Maupin, through Oct. 22?Anyone who played with dollhouses as a child, enjoys miniature displays in history museums, or can't resist peering into parlor windows when walking by illuminated brownstones at night will immediately be drawn to "Home Within Home." The main sculpture shows what it would look like if the house where Do Ho Suh lived in his native Korea crashed into the second story of the house where he lived in Providence, R.I., the latter sliced in half and opened up to reveal impeccably re-created rooms and objects. Vik Muniz at Sikkema Jenkins & Co., through Oct. 15?Vik Muniz's new large and luscious photos are inspired by art history. The Brazilian artist collaged together scraps torn from magazine pages that coalesce in compositions that riff on iconic artworks, such as van Gogh's 1889 painting Wheatfield with Cypresses and Gustave Caillebotte's The Floor Scrappers (1875), two of the show's high points. Alex Katz at Gavin Brown, through Oct. 8?For his first solo at Gavin Brown, the 84-year-old Katz shows 13 monumental canvases: single heads brightly lit against dark grounds; a smattering of wildflowers, little more than colored brushstrokes; and a nocturnal landscape in the form of a Rorschach blot. Elegant as always, and even more so in the artist's new digs. Paul Henry Ramirez at Galerie Richard, through Oct. 15?New to the Chelsea scene, this Paris-based gallery makes a splashy debut with a dazzling show of recent paintings by Paul Henry Ramirez. Bring your sunglasses and your Dramamine-some of these Day-Glo canvases are kinetic. Mindy Shapero at Marianne Boesky, through Oct. 22?The things Mindy Shapero can do with thumbnail-shaped paper cutouts and multi-colored puffy paint . . . Her highly tactile exhibition "Breaking Open the Head" includes a triptych of hollow, head-shaped sculptures, eight gridlike works on paper, and fanciful sculptures that look like a cross between molecular models and jewelry sized for a giant. Lee Bae at Nicholas Robinson, through Oct. 22?Korean-born Lee Bae, who has lived in Paris since 1990, offers paintings, drawings, collages and sculptural installations that bring technical mastery—and a spiritual intensity—to the interplay of black and white. The ominous-feeling installations present large charcoal blocks bound upright with cord or worked into rough skull shapes and mounted on the wall like grim trophies. Susan Rothenberg at Sperone Westwater, through Oct. 29?Goya-esque dogs, dolls and ravens share the nervous pulse of Susan Rothenberg's signature stroke in 13 new, mostly large, canvases. It is her first show in the gallery's new Bowery space, where the works are granted the atmosphere of quiet contemplation they deserve. 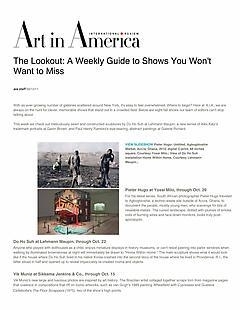 The Lookout is compiled by A.i.A. 's Leigh Anne Miller.